Today the boys had an extra day off so they could sleep in for as long as they wanted. While I was lounging on the couch I decided to go on Instagram and refresh it when I checked my what awarded profile I took three double takes "OMGGGG!" I yelled jumping up and down "what&apos;s going on? Whatawarded happend?" Daniel said waking up. "I Just Hit a million on Instagram!!!" I screamed running and tackling him back on the bed "woah you are pretty strong" he said while I was staring at him "take a picture it&apos;ll last longer" he said "okay" I responded and I did. As I was looking at my phone I felt a gaze so I looked up at Daniel "what?" I asked smiling "oh nothing" be said laughing go himself "no tell me" I said whining like a baby "this" he said then I felt his lips on mine but I had to regerster what happened then I kissed back then I heard someone clear their thought so Daniel and I both broke apart and turned to the bathroom to see Corbyn standing there awkwardly scratching the back of his neck. "You know what? I am so sorry I&apos;m just gonna go" he said and with that he left our room. Daniel started laughing which made me smile "why is he so  adorable" I thought "awe you&apos;re adorable too" Daniel said but then I realized I said that out loud and he laughed again so I punched him in the arm and went to the bathroom he was still laughing. But I tuned him out by turning on the shower. After I got done I did light makeup and put half my hair up and half down. As I was putting my clothes on I noticed I left my shirt on back in the room so I walked out with my bra and shorts on  until I saw Zach and hr saw me he was turning really red so I quickly grabbed my shirt and sweater and went back in the bathroom. After I put my clothes and stuff on I walked back out and saw Zach sitting on the couch "Hey Ashley I heard you hit one million congrats" he said smiling "thanks" I said smiling then there was an awkward silence "we should celebrate" Zach said and I nodded "come on" I said while walking towards the door we both walked to the other room to tell the boys they all congratulated me and hugged me "okay so where to first?" 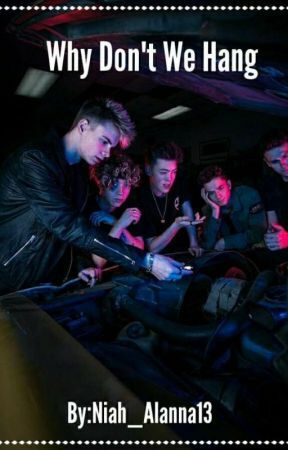 Jack asked "shopping" I said jumping up and down "okay let&apos;s find a mall" Jonah said after that we headed to the mall I ended up with Jonah and Jack so I dragged them into Charlotte&apos;s Russe and found a lot of things,tried on a lot of things, and bought a lot of things. "Jonah can I pleasee get a piggy back ride?" I asked in a little kids voice "sure hop on" he said giving in. I was on his back for like 5 minutes then we left to find a beach. When we walking around the beach I fell asleep on Jonah&apos;s back "hey Ash wake up" I heard someone whisper "hey wake up" I heard again then I recognized it was Jonah "oh sorry" I said sitting up we eventually had a singing session at the hotel "hey Jonah?" I asked tapping his shoulder he looked up at me "you have the most confortable back and shoulders ever" I said and he laughed and went on Instagram and recorded me while saying "say it again" and I did. Then I recorded Corbyn "hey Corbyn" I said and he smiled to the camera. We all took Snapchats and Instagrams until we all fell asleep. "Goodnight Ashley" I heard Daniel whisper before I drifted off into sleep.